Dr. Robert K. Chin received his B.A. degree in philosophy from The Johns Hopkins University. He received his Ph.D. from the Committee on Immunology at the University of Chicago, where he researched T cell development and how radiotherapy enhances anti-tumor immunity. Dr. Chin subsequently won the Leon O. Jacobson Prize for research when he received his M.D. degree from the Pritzker School of Medicine at the University of Chicago in 2006. He completed his clinical specialty training in Radiation Oncology at Stanford Cancer Institute. 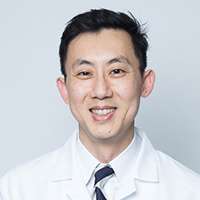 Upon graduation, Dr. Chin joined the faculty at the University of Chicago as Assistant Professor. He focused on malignancies of the head and neck, central nervous system, lung, and gastrointestinal systems. He routinely performed single and multi-fraction radiosurgery cases for brain, liver, and lung lesions. His clinical protocols focused on radiotherapy dose reduction in HPV-associated head and neck cancers. Dr. Chin has been an invited speaker at both national and international scientific meetings. His research has been published widely in leading scientific journals, and includes first author papers in Nature Medicine, Nature Immunology, and Proceedings of the National Academy of Sciences. Outside of the clinic, Dr. Chin has a special interest in self-sustaining public health projects in Southern Africa. He hasreceived grants for these efforts, and has worked or studied in South Africa, Mozambique, Zimbabwe, and Cuba. In his spare time, Dr. Chin dotes on his aging motorcycle and works on the next big idea.